Young people continue to support the RCD Fund, showing that they too can make brain matter. Bayside charity, the Robert Connor Dawes Foundation (RCD Fund), has seen exponential growth since its outset less than 12 months ago. This has been attributed to the substantial support from the youth community. The fund was established in honor of local boy Robert ‘Connor’ Dawes, who lost his battle to a brain tumor in April 2013. Since then, Connor’s family and friends have worked tirelessly to build a foundation to support the research of pediatric brain cancers and the care and development of children fighting this disease. The RCD Fund’s individuality comes from it’s marketing towards young people. Executive Director of the RCD Fund Liz Dawes sees the youth as having a positive, uplifting energy about them and that given the opportunity, can make a difference in a battle relevant to them. “Brian cancer is the most common, and fatal of all childhood cancers”, said Ms Dawes. Ellen Dooley, 20, was a close friend of Connor’s and has been heavily involved in the promotion and operation of the RCD Fund. She said while some are involved due to a personal connection to Connor, there were many who were simply inspired by his story. “Prior to theRCD Fund, my friends and I didn’t have much to do with charity & fundraising”, said Ms Dooley. Statistics from the Cancer Council Australia and the RCD Fund. Last September, RCD Fund held the inaugural “Connor’s Run”, an 18.8km fun run with 2000 competitors raising over $100 000 that recently won the Bayside Community Event of the Year. 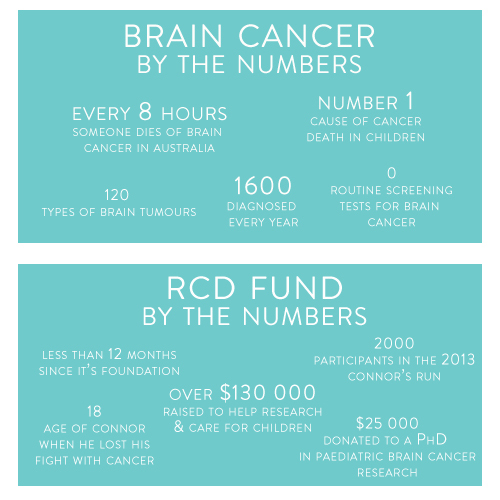 Now in the midst of launching Victoria’s first Brain Week , the RCD Fund has a chance to partner with the Cancer Council Victoria to raise the awareness of Brain Cancer and it’s desperate need for research funding. With the slogan “We Have 7 Days To Make Brain Matter”, the RCD Fund is building this awareness through schools, looking for statewide support. Its goal is to have a collective voice putting brain cancer on the map so that more funding and research can go into eradicating the most lethal of all cancers. Brain Week will start on Sunday the 27th of April. Registrations for the 2014 Connor’s run will open in the coming weeks.